Palæovertebrata (Print ISSN: 0031-0247, Online ISSN: 2274-0333) is the publication of the Department of Paleontology	of the “Institut des Sciences de l’Évolution”	from Montpellier, France. The first issue of the journal appeared in 1967. Palæovertebrata publishes original contributions on all aspects of vertebrate paleontology, including taxonomy, phylogeny, paleobiogeography, functional anatomy, biostratigraphy, paleoecology, and taphonomy. 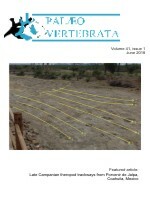 Since 2013, Palæovertebrata is also the official journal of the European Association of Vertebrate Palaeontologists (EAVP). Palæovertebrata is the partner journal of MorphoMuseuM. We encourage to store inside MorphoMuseuM	all 3D datasets analysed in Palæovertebrata articles. Palaeovertebrata.com is now developped and maintained by Renaud LEBRUN. Archive digitization : Elisabeth CABIROU and Renaud LEBRUN.